WASHINGTON, D.C—Over 200 federal and military officials attended a gala at the Kennedy Center in Washington, D.C. this past weekend to celebrate staying out of Iraq for three whole years. The lengthy military hiatus, described as “a pleasant surprise” by President Barack Obama, was broken four days ago with orders to send 800 troops and military advisers into the nation of Iraq to prevent the advance of the Islamic State of Iraq and the Levant (ISIL). 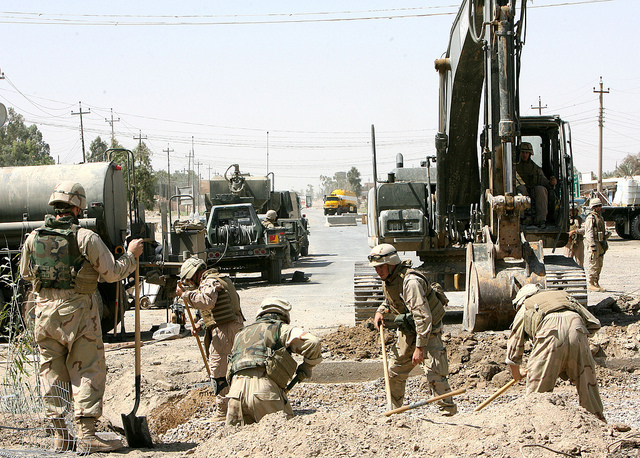 While the specifics of American strategy in the developing Iraqi conflict have yet to be defined, experts are confident it will involve a great deal of digging ourselves into deep holes, as seen in this photograph from the previous conflict. At press time, several top United States military officials were pondering whether now is also an appropriate time to re-initiate military action in North Algiers, after almost 200 years of peace following the Algerine War in 1815.